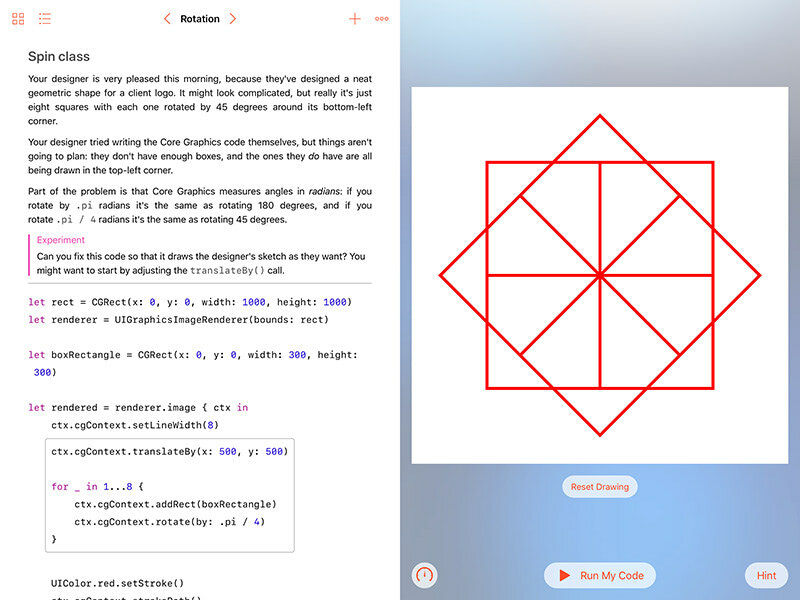 Apple's Swift Playgrounds app for iPad makes it fun and easy to learn Swift, and my playground books give you the chance to see my code, then edit it and explore the results. Learn Core Graphics uses the full Core Graphics API, so you'll learn real skills that you can transfer to iOS and other Apple platforms. Better yet, as you learn you'll see the results of your drawing right next to your code, so you can experiment freely. Swift in Sixty Seconds takes my introductory Swift tutorial and packages it up in an interactive playground you can experiment with. You get both the text and the videos, all offline on your iPad. Both playground books are completely free, so if you're using an iPad right now you can click the button below to get it. This will subscribe you to the Hacking with Swift playgrounds feed, so when I make more playgrounds in the future you'll be able to get them too. I hope you enjoy this approach to learning Swift – please feel free to get in touch by email at paul@hackingwithswift.com or on Twitter at @twostraws if you have questions, suggestions, or other feedback! In case you're interested in learning how to make your own playground book, I can highly recommend session 413 from WWDC 2018: Create Your Own Swift Playgrounds Subscription – it inspired me to try this out, and I hope it will inspire you too!